Allan and Edythe Arnott (nee Rex) were raised and obtained their early education at Darlingford, Manitoba. They graduated from Morden High School. From 1942 to 1945, Allan served in the Royal Canadian Air Force and the Royal British Navy. After obtaining a Diploma in Agriculture from the University of Manitoba, Allan returned to the family farm at Darlingford. Following her training at Success Business College, Edythe worked as an administrative assistant in the Corps of Army Engineers at Fort Osborne Barracks. Allan and Edythe were married in 1945. They raised four children: Valerie, Diane, Vicki and Tom. For over 50 years the Arnotts worked side by side managing and operating a large-scale farm. Edythe handled the day-to-day administrative details related to the farming operation, including staff, marketing and accounting. The Arnotts’ large grain enterprise included cooperative programs with the University of Manitoba, provincial agriculture extension services and private companies. Allan worked with the University’s Plant Science Department on breeder seed trials for triticale at his farm and in Yuma, Arizona. He actively promoted the introduction of canola in south-central Manitoba and during the 1960s worked with an Illinois seed company testing over 1200 hybrid wheat varieties. As well as setting up a small company to export grain augers to Australia, Allan established Arnott and McElroy Seeds, Arnott Seeds, and Arnott Family Farms, which grew and marketed certified seed. Allan’s off-farm activities included: advisor to the Bank of Montreal Farm Services; member of the National Farm Debt Review Board; and member of the Advisory Committee to the Federal Farm Credit Corporation. The Arnotts were early adopters of new technologies. In cooperation with Connaught Laboratories, Edythe established a 120-sow Specific Pathogen Free herd for research and breeding purposes. Her 25-acre U-Pick raspberry business supplied root stock to North Dakota growers. Allan was a member of both the Manitoba Seed Growers’ Association (MSGA) and Canadian Seed Growers’ Association (CSGA). In 1972, he received the MSGA’s Outstanding Service Award and in 1983 the CSGA’s Robertson Associate Award. In 1987, the Arnott farm was designated a Manitoba Century Family Farm. 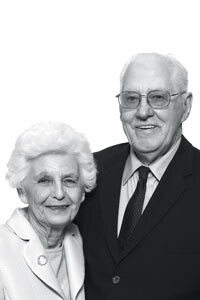 Allan and Edythe served on the local school board, the United Church board, parent-teacher associations, the Manitoba Association for Children with Learning Disabilities and the Winkler Bible Camp Building Committee. In 1975, the Arnotts took on a two-year Canadian International Development Agency (CIDA) assignment in Nigeria to demonstrate new farming methods in the rural areas. Allan and Edythe shared their knowledge and experience, as well as their passion, for farming with everyone they met.